The Declaration of Independence on display at Independence Hall in Philadelphia. David Amsler, via Flickr . We celebrate its adoption on the Fourth of July, yet few of us have actually read the Declaration of Independence in its entirety. Political scientist Danielle Allen set out to change that. In 2014 she talked to Diane about her book, “Our Declaration,” which makes the case for a new interpretation of the document as a living, relevant text with an argument for equality at its core. Inspired by her experience teaching the Declaration to her adult night students on the South Side of Chicago, Allen invites readers to examine the historical document that she says holds particular significance today. 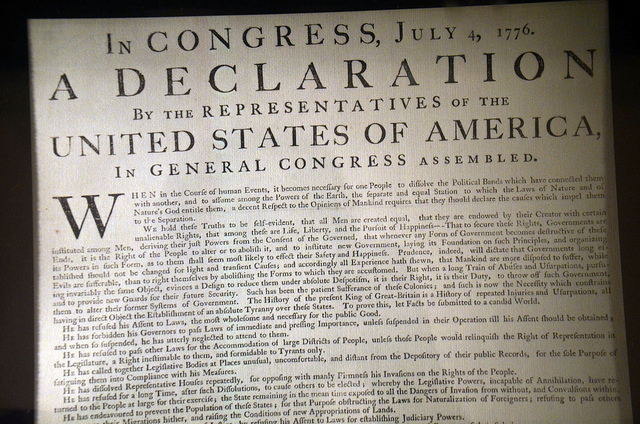 A listen from the archives for the Fourth of July: Equality, democracy and a fresh reading of the Declaration of Independence.